As of Tuesday night, the Warriors have a 7-12 record, and won their last matchup against the Sacramento Kings 93-90. This season hasn’t gone exactly how Mark Jackson envisioned, but there does seem to be some significant improvement from last season. The Warriors’ bench is much stronger than last season and the overall team defense is stronger, but the Warriors still have issues with their offense and their production from the center position. 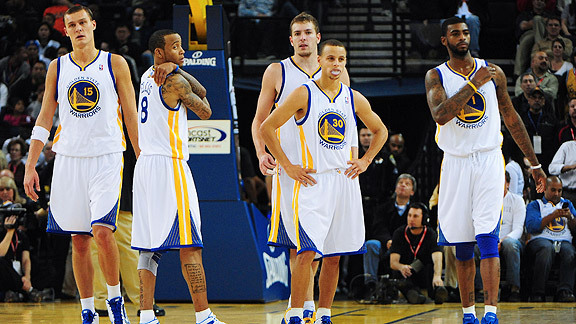 The Warriors’ second unit, now informally called the Dubstitutes, consists of Nate Robinson, Klay Thompson, Brandon Rush, Ekpe Udoh, and Jeremy Tyler (or Dominic McGuire depending on how small Mark Jackson makes the lineup). Compared to last years’ second unit of Acie Law, Reggie Williams, Vladimir Radmanovic, Lou Amundson, and Ekpe Udoh, this years’ bench is a noticeable upgrade. Nate Robinson has brought a fun, exciting energy to the second unit that not many Warriors have been able to bring since Baron Davis. Klay Thompson, after struggling mightily during the preseason and the beginning of the regular season, has bounced back nicely from a mini rookie slump and has really found his shot nicely. 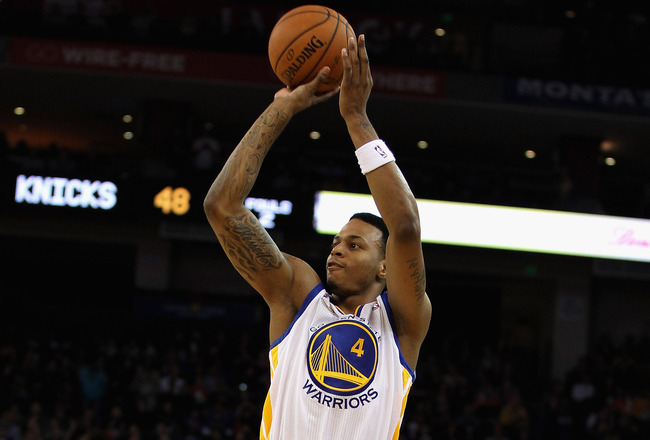 Brandon Rush has been consistent since the beginning of the season. He’s tied with Ray Allen for first in the league in 3-point percentage with 57.1% (as of Tuesday before the game against the Kings). Rush is also a fantastic rebounder for his size and is a great defender. Ekpe Udoh continues his growth in his sophomore season. He continues his defensive prowess, He’s added a nice hook shot to his repertoire, but he still needs to improve his rebounding. Jeremy Tyler is working hard and still learning, and Dominic McGuire is also a solid rebounder and top-notch defender. The Warriors’ defense has also significantly improved since last season. The stats don’t suggest the Warriors are an elite defensive team, but improvement is all that matters at this point. The Warriors are playing more scrappy and aggressive defense. They trap players and double-team a good amount, which usually can throw a team off and force kick-outs. The Warriors have also played zone defense rather effectively as well. When the Warriors are able to play lock-down defense and start their transition game, they create several opportunities for themselves. In the transition, they can score with their speed (specifically, Monta Ellis’ speed), they can score by driving to the hoop and kicking the ball out to Stephen Curry, Dorell Wright, Brandon Rush, or Klay Thompson for a wide-open three pointer, and they can get it inside to David Lee. Stephen Curry is a creative passer who can make great, quick decisions in fast break opportunities. At the beginning of the season, the offense was in total disarray because of the intense focus on defense during training camp. They’ve found a little more flow and rhythm to their offense now that the rotation is mostly set. With Stephen Curry out 9 games with a nagging ankle injury, the Warriors’ offense didn’t have its point guard and floor leader, so this is a partial explanation for the confused offense. Now that Curry is playing consistently again, the offense is starting to come together. 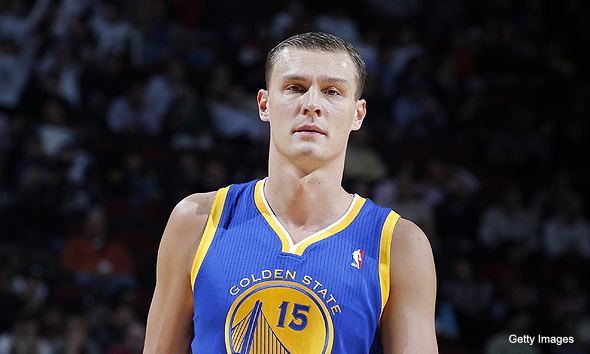 However, Andris Biedrins is still a complete mystery. He has completely disappeared from every game, and without a competent center, the Warriors have struggled to get offensive rebounds and easy points on post-up plays. Although Kwame Brown is known more for his defense, he was becoming the aggressive center the Warriors needed, on the offensive end also. However since Brown is out with a torn pectoral injury, Mark Jackson has no offensive threat at the center position and this has definitely lead to some of the struggles on offense. The Warriors have had a season full of ups and downs. As much as the Warriors have improved on defense and bench production, offense continues to be a weakness. The Warriors have had trouble closing out games and playing consistently for all four quarters. David Lee has had a spectacular season, Dorell Wright has finally found his shot and playing like he did last season, most of the bench players have played solid all-around games all season, and now the Warriors need more consistent play out of Stephen Curry, Monta Ellis, and Andris Biedrins to make that next jump to the playoffs. No one knows if this same team will be intact after the All-Start Break, but if it is, more adjustments needs to be made. Although it seems unlikely that the Warriors will make the playoffs, they have shown significant improvement and continue to make strides toward being a playoff team. The Warriors have started off the 2011-2012 season with a 2-6 record (as of Tuesday), with their last loss coming at home against the Jazz on Saturday night. This loss stung a little more than the rest for several reasons. First of all, the Jazz aren’t a particularly good team, so this should’ve been a fairly easy win for the Warriors. Second, the Warriors were in the game until the very end and had many opportunities to seal this win. Despite a slow start, the Warriors, behind Monta Ellis and some timely shooting from Brandon Rush and Nate Robinson, were able to stay in this game without Stephen Curry or Andris Beidrins and a poor shooting night from David Lee. However, with 16 seconds left in a tied game, Monta Ellis committed a turnover that practically lost the game right then and there. 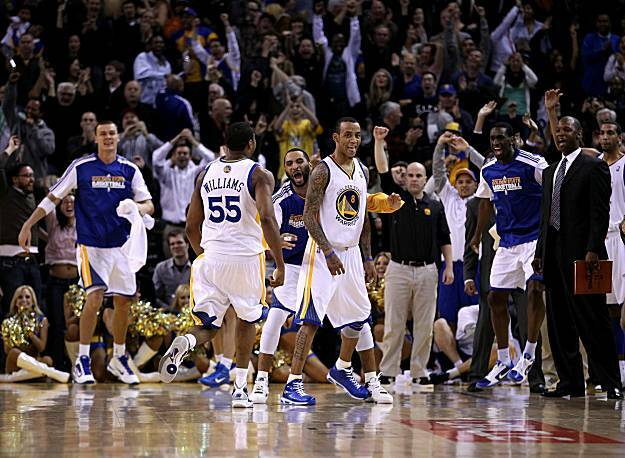 To many Warriors’ fans, Monta Ellis is an elite clutch player. Warriors’ coaches must agree because in every possible situation where the Warriors can take the last shot (even if it’s at the end of a quarter and not in a typical “clutch” situation), they turn to Monta. This makes absolutely no sense though. Yes, he made two great shots last season to either tie the game or win the game. This does not justify him taking the last shot every single time, even at the end of quarters. Besides his two shots last season though, he has not been consistent enough to be the #1 choice in those type of crucial situations. No one really knows if the Warriors have any other great clutch shooters, because no one else besides Monta has received an opportunity. Both Stephen Curry and Dorell Wright had some big shots last season during important games, but neither players were given a chance at taking a potentially game-winning or game-tying shot. Therefore, the Warriors have relied on Monta for all clutch shots. Monta does have a lot of characteristics of a clutch shooter. He’s extremely confident, he’s quick, and he can create plays for himself. However, he does not have the natural “clutch” instinct. A clutch player needs to know how to manage the shot clock well and have a back-up plan. Generally, he dribbles too much and just wastes time. He must believe that he only needs a couple seconds to get a good shot off because of his amazing speed. By dribbling the ball at the top of the key with no real plan in mind, Monta ends up hurting himself. If he started his drive about 2 seconds earlier, it would give him the chance to find an open teammate, if he’s heavily guarded, or still get off a good shot. Although it’s maddening to admit it, Monta has improved in getting his teammates more involved and is averaging 8.1 assists per game. If he’s guarded closely, he has the skills to pass it off to a teammate, so that should always be an option in his mind. It’s clear based on his track record though that he wants all the glory and credit for winning a game, so he wants to take the final shot no matter what. Another aspect of Monta’s clutch game this is quite troubling is his predictability. He has a broad skillset, and one would think that he would utilize these particular skills and become more creative with his clutch shots. However, Monta pretty much does the exact same move every time. He generally drives as if he’s moving towards the right elbow of the free throw line, crosses over to the left or steps back, and shoots a left elbow jump shot (watch the videos below to see the two clutch shots that Monta hit last season to see this pattern). Perhaps this explains why Monta has not found much luck in clutch shots recently. Defenders are able to easily predict what moves he is going to make. Also, teams can always send a second defender over towards him because they know he will not pass the ball. If Monta wants to continue to be the clutch player on the team, he’s going to have to change his ways. It’s as simple as that. Since teams know now that the Warriors use Monta in those types of situations, why not use him as a decoy? Mark Jackson could set up a play so Monta winds down the shot clock, drives to the hoop, and sets up a kick out pass to Stephen Curry (when he returns from injury), Brandon Rush, Nate Robinson, Dorell Wright, or even Klay Thompson. Monta needs to either become a smarter clutch player or the Warriors need to start finding some other options. Even great clutch shooters like Kobe Bryant miss some shots. That’s understandable. However, Kobe has to take the clutch shots because the Lakers simply don’t have any other options to go to in those situations. Monta has options though. He could dish to several of his teammates, or Mark Jackson could draw up a play for someone else like Stephen Curry or Dorell Wright. If the Warriors want to win more of those close games, they need to re-examine their strategies at the end of games.